Antique silver, jewellery and timepieces from both the West and Asia are well established categories at Fine Art Asia. Visitors will have an opportunity to appreciate and acquire fabulous pieces of distinction, each with a unique history and provenance. Koopman Rare Art, London, one of the world’s foremost dealers in fine antique silver, has built up some of the most important private collections of silver and worked closely with leading museums worldwide. Highlights of Koopman Rare Art’s exhibition at Fine Art Asia 2018 include an important 19th century silver Chinese punch bowl, made in Shanghai and Canton in 1897. The bowl has four dragon feet with a band of swirling clouds. The main body is chased and engraved with scenes of river life, horses, bridges and mountains in the background. The handles are formed as cast and applied dragons. 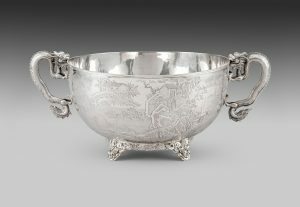 The centre of the bowl has a presentation inscription: “To H.W Wilkinson Esq. H.B.M’s Vice Consul on his departure from Chemulpo where they had for three years enjoyed his protection. The Chinese Residents as a token of gratitude and a mark of their esteem presented this bowl June 1897.” Sir William Henry Wilkinson was a British Sinologist who served as Consul-General for Her Britannic Majesty in China and Korea. 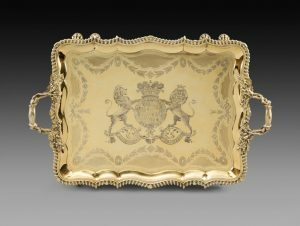 Another major piece is an important George IV silver-gilt tray, made in London in 1823, with the maker’s mark of Philip Rundell, who was appointed Goldsmith and Jeweller to the King in 1797. The arms are those of Lucy quartering Percy, for Hugh, 3rd Duke of Northumberland K.G. (1795-1847). Susan Ollemans, London specialises in Mughal and antique gold Indian jewellery, as well as antique gold articles from China and Southeast Asia, and Chinese works of art. Highlights of her exhibition at Fine Art Asia 2018 include a jewelled Bazu band from Northeastern India dating from the 19th century. The band has a rectangular central section and two triangular wings, each with a floral element at its apex allowing for braided cords to be attached and adjusted for size. 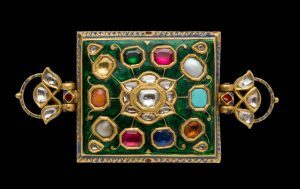 The rectangular section of the bazu is set with 30 flat diamonds, rhythmically filling the spaces between the nine auspicious gems known as the Navaratna, each of which is set on one of the cardinal points and in the centre. The wings are likewise set with smaller diamonds and a small ruby. The back is finely enamelled with flowers and petals in red and blue against a white ground, and with green champlevé enamel directly applied into the metal. Another important piece is an annular ornament from the Gupta Period in India, c. 5th century. 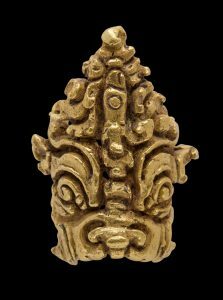 The ornament is of a type found across the Hindu/Buddhist koine, and though this infers widespread use, its exact function has not been determined. Some believe that they are ear ornaments, others believe that they were “bird rings” to identify or adorn a particularly prized bird, while yet others believe they were used as ornamental finials topping a ceremonial staff. This example shows a stylised male mask with a threatening expression, deep-set eyes and exaggerated brows. Lucky Jewelry, Taipei will again present both rare Asian jewellery and iconic Western pieces. From India comes an antique jade and gem-set archer’s ring, bangle and buckle, c. 18th/19th century; an antique diamond, ruby, emerald and enamel jigha (turban ornament) c. 18th century; and a very fine pair of antique diamond, ruby, enamel and gold tiger’s head kadas (bangles), c. 18th century. Among iconic Western pieces is a natural sapphire brooch, featuring a 60-carat sapphire from Ceylon, designed by the French jewellery designer Jean Schlumberger for Tiffany in the c. 1960s. Schlumberger’s (1907-1987) witty and exciting designs made him a darling of the Parisian scene and he rose to become the most acclaimed jewellery designer of his time. In 1956, Schlumberger joined Tiffany & Co. where his nature-inspired designs were quickly embraced by the world’s most fashionable women including the Duchess of Windsor, Greta Garbo, Gloria Vanderbilt, Elizabeth Taylor, Audrey Hepburn and Jacqueline Kennedy. 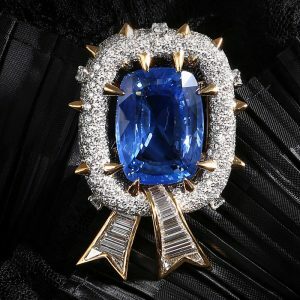 The ribbon around the sapphire presents the brooch as a chic and precious present. 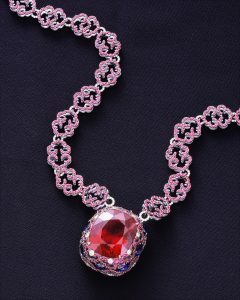 Also on offer are a collection of jewellery pieces by renowned Chinese contemporary designer Wallace Chan, including a beautiful necklace featuring a large rubellite weighing 62 carats of perfect colour and clarity. Set on titanium with incised openwork, it is encircled by vivid blue sapphires which accent the splendour of the red gemstone. The long necklace is composed of diamond-set ruby links fashioned in an elegant and delicate double ruyi-pattern, bringing blessings to whoever wears it. 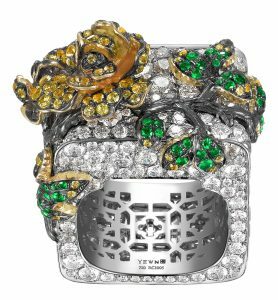 Yewn, Hong Kong focuses on contemporary fine jewellery pieces inspired by China’s 5,000-year-old artistic heritage. Dickson Yewn uses sophisticated 21st century craftsmanship to make exquisite jewels that remind us of the national treasures once produced by the Imperial artisans. The design themes he creates in his fine jewellery collections include Lattice, Paper Cut, Manchurian, Lock of Good Wishes and Glorious Peony – auspicious symbols of good fortune that are always central to Chinese philosophy and culture. 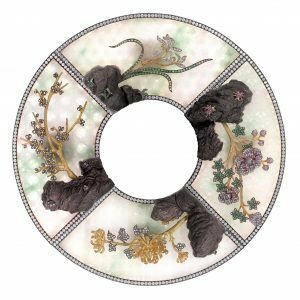 Highlighted at Fine Art Asia 2018 are pieces from his Royal Porcelain and Zi Ran Series. With his distinctive aesthetic, Yewn crafts a link connecting the lost centuries between China’s glorious past and its re-emergence as a modern creative force in Oriental arts and design. On Tung Jewellery, Hong Kong specialises in exquisite jadeite jewellery, both antique and contemporary. Among the antique pieces, a highlight is an exceptional pair of cylindrical jadeite lingguan pendants dating from the late Qing Dynasty. The lingguan was a unique object in the Qing Dynasty court, a symbol of an official’s class and official rank. All officials were obliged to wear the guanmao (top hat) when they attended court, and the lingguan was attached to a jewelled bead on the hat so peacock feathers could be inserted. 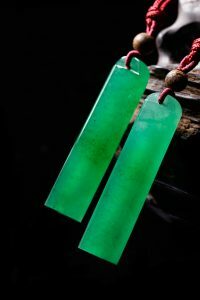 Only civil officials with the first rank could use lingguan made of jadeite and such fine examples that have survived until today are very rare and valuable. In a unique artistic collaboration, Yewn and On Tung present a Four Seasons objet d’art. 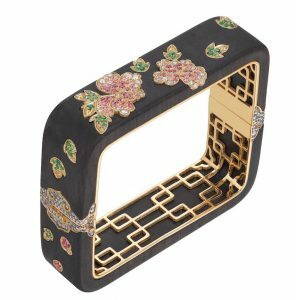 This five-piece treasure box ensemble was inspired by a traditional Chinese literati garden scene and is a union of fine Chinese contemporary jewellery and jadeite, as well as tradition and modernity. It consists of a central round compartment, surrounded by four fan-shaped compartments symbolising the four seasons of the year. All five sections are made from the same rough specimen of finest Burmese jadeite. Four detachable flower-themed brooches embellished with precious jewels are cleverly fixed onto classical scholar’s rocks by means of hidden catches, so that the jewellery is perfectly camouflaged in the scenery. The back of each jade compartment is decorated with Yewn’s iconic and auspicious willow, tortoiseshell, begonia and gold coin lattice designs which echo the door and window frames in the corridors of an Imperial garden. The circular central compartment features an ice ray lattice pattern highlighted with diamond plum blossom petals on a partially frozen lake set with rose diamonds. 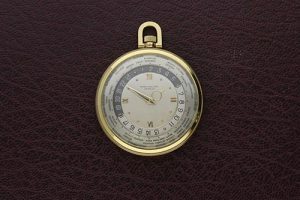 Somlo Antiques, London is the UK’s leading specialist in antique pocket watches and vintage wristwatches. The gallery deals in rare timepieces spanning 400 years of horology, from early 16th century pre-balance spring watches, fine quality enamels, complicated repeaters and elegant Art Deco cocktail watches, to contemporary wrist watches by leading houses. At Fine Art Asia 2018, Somlo Antiques will present a Patek Philippe World Time pocket watch. In 1937 Patek Philippe released the reference 605HU (Heures Universelles) which was designed by the genius watchmaker Louis Cottier. His mechanical design was easily set and read all from one dial. The watch features a rotating 24-hour dial with an outer rotating ring with 42 world cities. The local time is set at the 12 position, and the watch would display the correct time for the remaining cities. 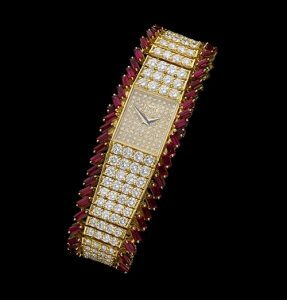 Another highlight is a Piaget ruby and diamond bracelet watch made in the 1970s. Piaget are known for their unparalleled skill in designing ornate jewellery watches. This mechanical bracelet watch is set with brilliant cut diamonds along the whole length of the bracelet and flanked with baguette cut rubies. Finally, an enamel pocket watch by Moser and Cie was made in Le Locle circa 1820. 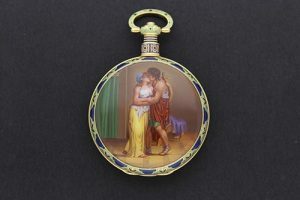 Made for the Chinese market, the enamel scene depicts ‘Apollo’s Embrace’ and is attributed to Jean François Victor Dupont. The key wound mechanical movement is intricately engraved and embellished.